On Monday night D and I celebrated 7 wonderful years together. We like to splurge and go somewhere extra nice for dinner and this year he decided to keep where we were going a surprise. Now don't get me wrong, I enjoy surprises but I really like to know what's happening! I kept bugging him to tell me where we were going but all he would do was drop false hints - like we were going to Sutherland, the cuisine was Turkish contemporary and that he hoped I liked entertainment with my meal lol. 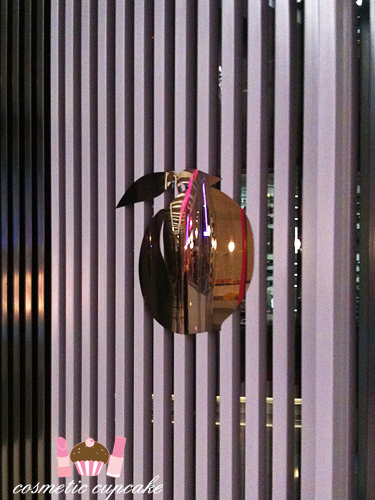 Of course Momofuku Seiōbo was absolutely wonderful - 15 courses of food heaven. 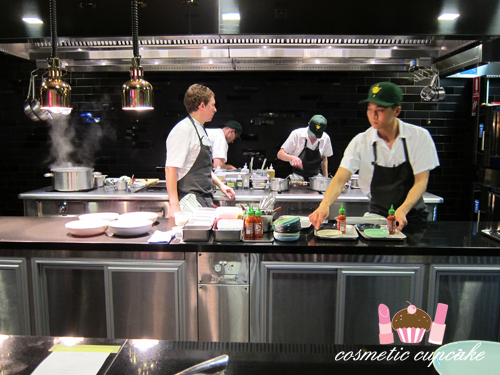 We were lucky enough to sit at the chefs counter/bench and it was amazing to watch the chefs cook. I'll be doing a separate post about Momofuku Seiōbo later. D couldn't have chosen a better restaurant and it was SUCH a wonderful surprise. We do love our food so very much! Since it was a work night I was getting pretty tired by the end of the meal and I suggested we head home to exchange gifts. He insisted we go for a short walk to Darling Harbour to walk to the food off. I'm absolutely full to bursting so I don't complain! We take a stroll and find a quiet spot and sit down to exchange gifts. D tells me to close my eyes while he gets my present out. I open my eyes and he places a large blue Tiffany's box in my lap and turns to me.. this is for you.. 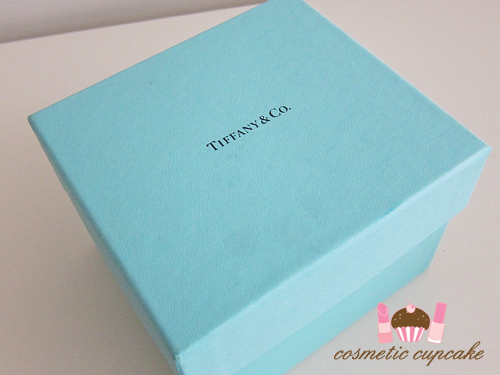 I open the box and inside I find a small porcelain Tiffany Blue Box that I have been coveting since forever.. I open the lid and I find a velvet ring insert in it which is not how it comes... but it's empty.. because it needs something in it.. and D reaches into his pocket.. and pulls out a ring. It's all not really sinking in at this point yet.. I start crying as he stands up to place himself in front of me and gets down on bended knee. He looks into my eyes.. I want to spend the rest of my life with you.. And then he asks me those four little words - Will you marry me? I'm a mess at this point - a mixture of tears, mascara and eyeliner is running down my face and I'm too choked for words. Of course I say yes (I think I just managed a tearful nod) and he slides the ring onto my finger. It's a perfect fit. After I'd finished crying I got a proper look at my ring and it took my breath away. It still does! I can only describe it as absolutely perfect in every single way. D designed the ring himself down to the very last minute detail over a few months. 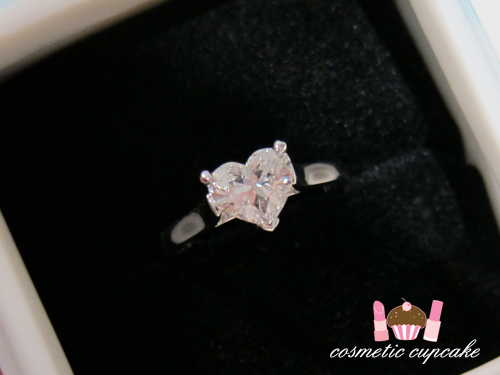 It's a 1.01ct diamond in a platinum setting with a white gold band. 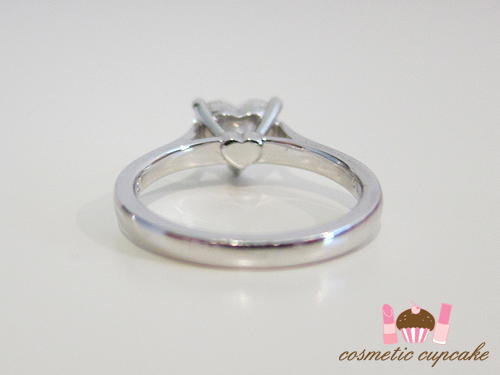 The small details he requested from the jeweler are so touching. Our initials are engraved inside the band by the engraver that engraves for Tiffany (I adore Tiffany & Co!!). The bottom prong is heart shaped as well as the prong setting (sorry I don't know the correct terms!). As one of my close friends said it's so very me. I am never ever taking this baby off! A HUGE thank you to all my tweeps and Instagram buddies for all your congratulatory messages! At Momofuku Seiōbo on our happy night! Congratulations again!!! :) Such a gorgeous proposal and a stunning ring!! I wish you and D a lifetime full of happiness together and all the best for the future!! I'm sure only more amazing things will come your way. Congratulations from Germany!!! A beautitful couple (and of course a beautiful ring!!)! OMG! I'm so happy for you two. And I'm the first one to comment and congratulate you here too, lol. No doubt this is the best Anniversary of all and the best anniversary present ever! What a lovely proposal and congratulations! It is such a beautiful and special ring :-) Am looking forward to the bridal manis! Congrats! A wonderful story, your ring is beautiful and you both look so happy! 'Chelle, again just wanted to wish you a massive congratulations! You borh look so gorgeous together, and I wish you all the best :) I know it will be an exciting time for you and D! Congratulations! I wish you a lot of love. Congrats!! I'm so happy for you and I'm sure all your other readers are too! omg love. I'm so happy for you! A HUGE congratulations to you!! I got a little teary reading your post too, your fiance is sooo sweet! Congratulations! I'm so happy for you :-) That is such a beautiful ring! OMG HOW EXCITING. Congratulations!!!!! That ring is beyond gorgeous and you two are absolutely adorable together. Many congrats! Aagghhhh, OMG congratulations! So happy for you guys! Now go float on your cloud 9 then come back and tell us all about any plans you're making. I love your story, and I am very happy with the proposal of your boyfriend. Congratulations!! The ring is gorgeous! Felicitation <3 Joyeux mariage !! congratulation !! happy wedding!! Such a lovely proposal story, made me so happy reading it! 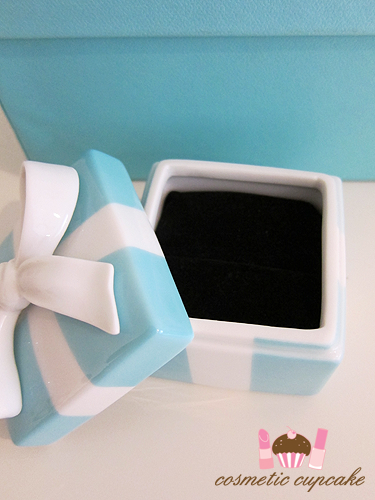 What a romantic fiance you have, the Tiffany ring box is too cute! Oh my god I have tears in my eyes! That is such a beautiful proposal, I'm so happy for you two!! I adore your ring!!! And I absolutely love love love the little heart details your fiancé chose. Soooooo sweet and LOVELY!!! IM SO SO SO HAPPY FOR YOU!!! Good work Den :) way to start off your life together. May God bless you both with his love and care, and sail you smooth through your life ahead with joy and smiles. WOW Chelle, how romantic!!! And what an absolutely gorgeous, PERFECT ring. 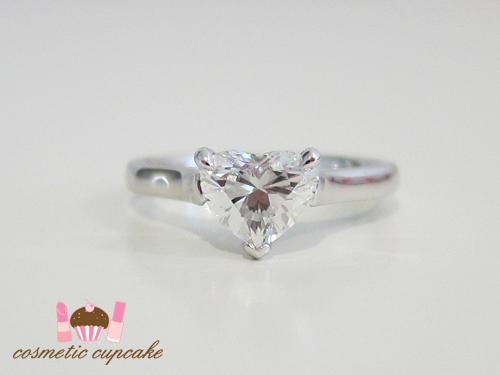 I LOVE the heart shaped prong. He's definitely a keeper! Oh 'Chelle I am so happy for you. :) Your ring is gorgeous and the fact that D customized it himself is amazing. :) I wish you the best. Congratulations, I loved hearing your proposal story, so sweet. Your ring is divine! Congratulations, and good on D, quite a proposal. Awww tears! I'm so happy for you - once you float down off that cloud, the real fun starts! Congratulations, and good on D, that was quite a proposal. Aww congratulations! That's absolutely romantic the way he proposed to you! I have a good laugh at the beginning when you said he was pretending to go into a gazillion restaurants. AHAH. Aw, congrats! I teared up as I was reading! Your ring is so amazing, love that it customized for you! & Can't wait to see the post on the restaurant! Very beautiful story! I wish u lot of happiness and joy and may years together. I wish you a life full of happiness and joy, You have a nice story and the ring is breathtaking. Congratulations. What a great catch you got there! Beautiful ring. He has fabulous taste. OMG CONGRATULATIONS!!!!!!! :D That's wonderful to hear! And the ring is damned fine, but you already know that! I betcha the family is very happy though huh? Especially the sis, haha! Oh, God! Congratulations! You make such a wonderful couple! Enjoy this time before the wedding, it will be unforgetable. Congratulations!!! I'm so happy for you! The ring looks FANTASTIC! I wish you the best!!! OMG CONGRATS CONGRATS CONGRATS! This was a very different blog entry but even I was so moved! Congrats to the both of you :) The ring is beautiful! ow sweetie I'm so happy for the both of you :) Congratulations!!! I know exactly how you must feel, I married my husband 1,5 years ago and indeed he's my love, my best friend and everything in between. Congrats Michelle! Loved your engagement story :) Looking forward to the Momofuku post! How sweet! Your ring is so unique and gorgeous, what a great guy. Congrats to the both of you! I haven't read blogs in SO long and I'm so happy this was the first post I've read since our engagement party... It's brought the BEST memories back. I'm SO happy for you lady, what a gorgeous proposal and I LOVE the detail of the ring. You're so, so lucky. Eeeeeeeeeeep!!! I'm smiling from ear to ear for you. Your story has made my day. Aaaw my dream proposal... I am so bawling right now. 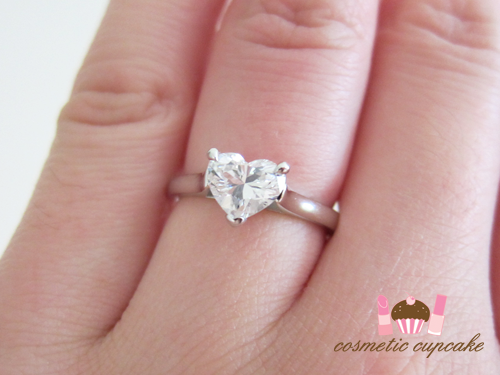 I actually brought my bf to tiffanys and showed him a heart-shaped diamond ring, you know what his respons was? "You should probably find yourself a rich guy if you ever expect such an expensive ring.."
congrats! The ring is amazing! Omg!! I hope im not too late. >.< congratulations 'chelle!! Here's to a wonderful life to the both of u!! U guys are soo perfect for each other!! Lots of love!! :D xoxo!!! Omg Omg omg omg omg-that ring! You were born to wear it! In just thrilled for you Michelle! Congratulations! Enjoy all the planning and special moments-it flies by! !